New iPhone owners: they’re the ones proudly walking around the office showing off their new device that’s bigger, better and prettier than yours. We all know one. In fact, there are over 10 million new iPhone owners given the launch of the 6 and 6 Plus last week. People across the country waited in line for hours, even camping out in front of stores just to be one of the first to walk out of the store toting a brand new bright and shiny iPhone. 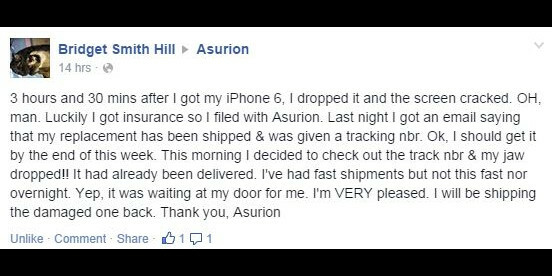 Despite the added safety features to make this phone less breakable than previous models, it’s still susceptible to loss, theft and damage– something this Asurion customer learned the hard way. Lucky for Bridget, she had her phone covered with mobile protection. She didn’t have to mourn the loss of her brand new iPhone 6 because there was already a new one on the way. Bridget’s story is not uncommon, this happens to people across the country every day. In fact, 80% of phones are lost, broken or stolen in the first 12 months of ownership. Think your phone will survive the first year (or the first day)? Don’t take the chance, get mobile protection. Ask your carrier for more information, or visit www.asurion.com.